Electronic warfare is a pretty new concept. In the world of 2017, communications like GPS and Wi-Fi make more complex processes, and our way of life, possible. There are many ways to attack systems like drones (UAVs) or networked security cameras, but often their data connection is the most vulnerable. Electronic warfare favors avoiding engaging these systems directly, instead choosing to disrupt and manipulate the data connection these automated devices rely on. Without a reliable connection, these devices often cease to function or revert to predictable, and exploitable, default behaviors. The Russian military has also invested heavily in jamming and electronic warfare innovation as a means of making American devices useless. Russia even demonstrated the ability to disable a US warship during a flight which knocked out the ship's power. The majority of these powerful attacks are hardware-based and require devices that would be illegal or expensive to own. Fortunately, not all techniques rely on hardware. 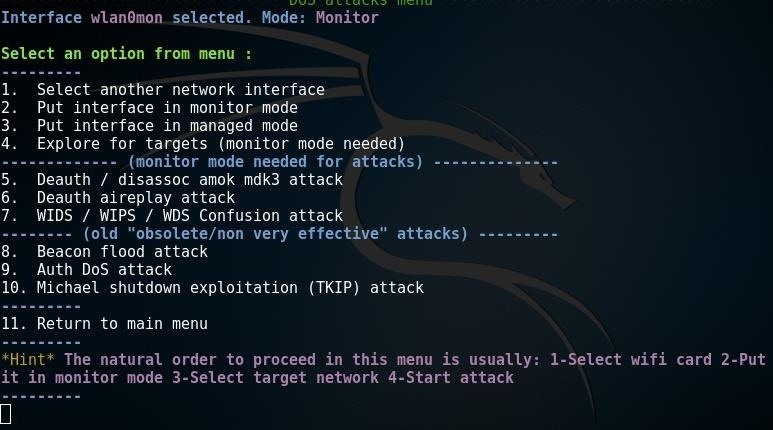 Today, we will focus on software-based attacks anyone with Kali Linux can employ. The "jamming" we are using, in this context, is one of many possible denial-of-service (DoS) attacks against a Wi-Fi network. Rather than overpowering the signal like a hardware jammer, a software jammer functions by forging network packets to continually request that all devices in range disconnect themselves. The process is described below. 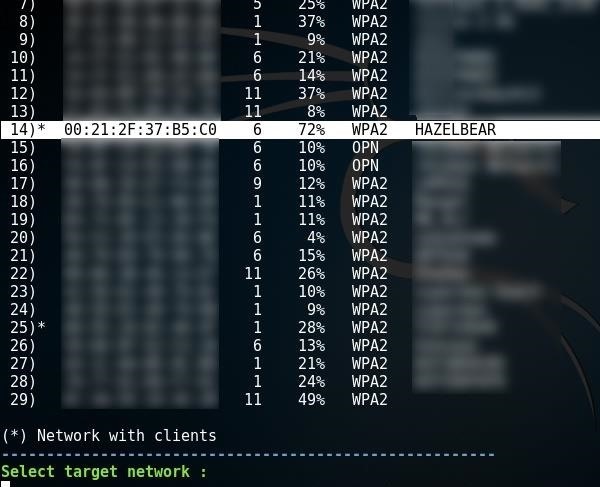 In our scenario today, we want to disable a wireless IP security camera connected to a network called "HAZELBEAR." Our target security camera relies on a Wi-Fi connection to stream video to a server. To disrupt that, we will kick all devices off of "HAZELBEAR" with Airgeddon. This will disable the camera from streaming video to whoever is watching or recording. 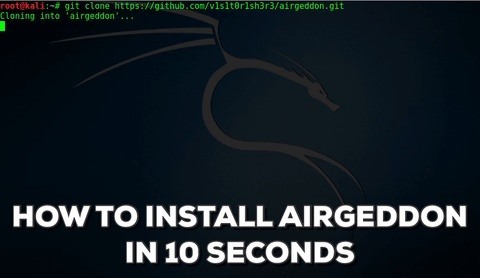 Airgeddon runs on Kali Linux. You can use an installation running on a virtual machine or on a $35 Raspberry Pi as I do in this demo to create a small portable option. If you'd like to run it on the Pi, check out our guide to setting up Kali Linux on the Raspberry Pi. 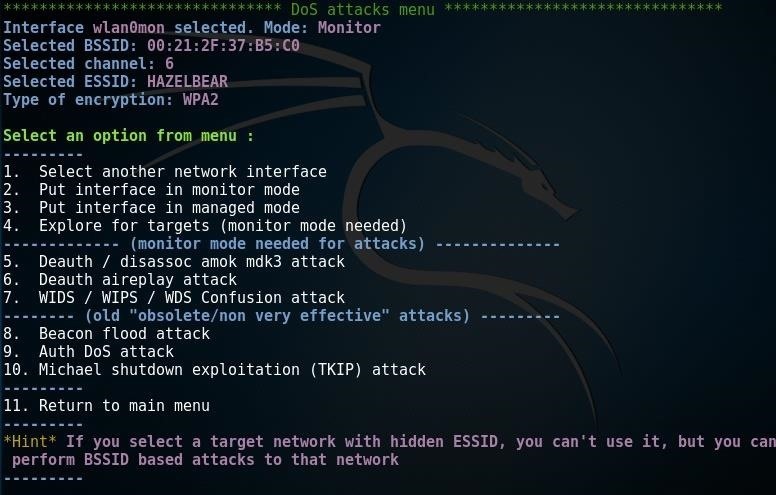 An Atheros AR9271, or another Kali-compatible wireless network adapter, must be capable of being put into monitor mode and packet injection, and you can find an excellent guide on Null Byte for selecting one below. The better the wireless adapter's range, the better your results will be. First, let's check your configuration. Kali Linux must be fully updated running Kali Rolling to ensure system needs and dependencies are current. Our interface is in managed mode, and we have not yet selected a target. 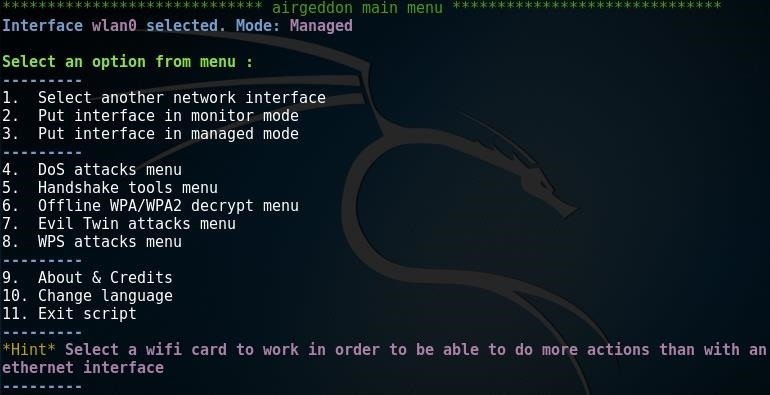 Managed mode means the card cannot inject packets, which renders our attack impossible. We will need to put our card into "monitor mode" in the next step. Ready the attack interface by typing "3" to select the third option, and follow the prompt to put your card into monitor mode. This allows us to inject forged packets which will convince target devices on the network to disconnect. Next, select option 4 to bring up the DoS attack menu. Select your attack option by typing the number next to it. 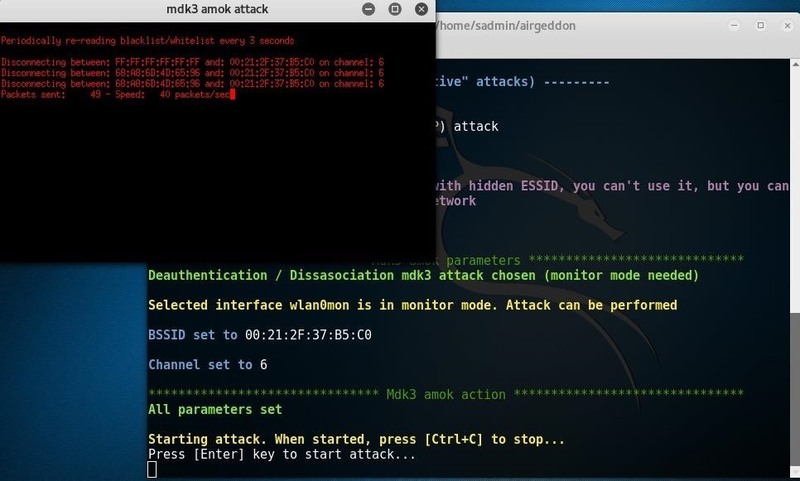 In this case, we will proceed with attack 5, a de-authentication / disassociation amok mdk3 attack. This uses the MDK3 took to send de-authentication and disassociation packets in "amoc mode." Other options are using the aireplay tool to spam de-authentication packets to targets, and overwhelming the target with WIDS / WIPS / WDS confusion attacks to flood the target with traffic. Looks like I'm having some network trouble. how can i find out a security camera is wireless or no ? Many of them run POE though. @Alexandru go by signal strength using a tool like Wigle with your Android phone eg is there a wireless signal and is it getting stronger the closer you get to the camera. Got a good signal? Lookup the MAC address to confirm make and model. NOTE: that a trained CCTV operator will spot you quickly or even far worse the system is running recognition and will snag you even in disguise. Sadmin, is it ok if I translate your posts into Korean and post it on a blog that I am going to create? It is so hard to find information in Korean so I thought that your posts would help Korean's who are not fluent in English. I will make sure to cite the source. This should be okay. I sent you an email. ??????? Are you a Korean? Come on, why doesn't Korean get recognized? On the first command installing the program it asks for user and password.what are they??? I'm actually getting the same problem. It's asking for a username and password for Git Hub. D'oh! Never mind! I was trying to type the address in manually, when I should have just copy/pasted from the guide. Im doing a security audit on my home network. 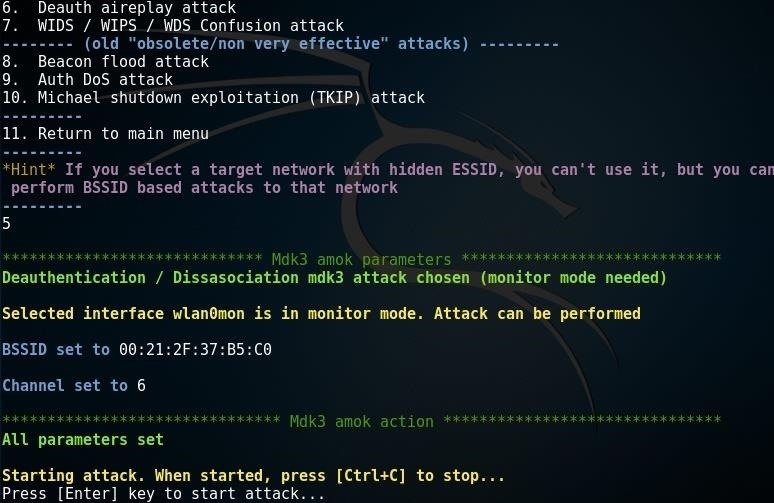 After I preform this attack, would I have to reset the router? 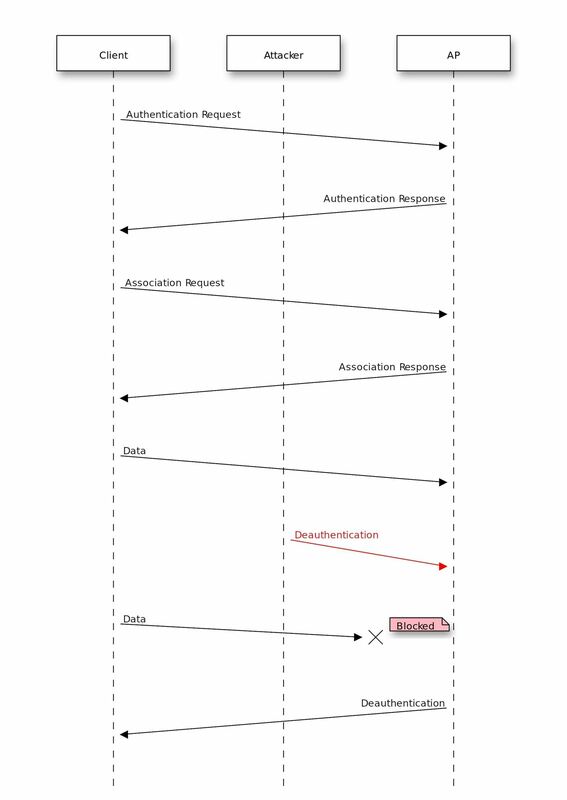 Or as soon as I stop Airgeddon the De-authentication requests would stop and data flow would return to normal? Typo on step 3 says, "Ready the attack interface by typing "3" to select the third option, and follow the prompt to put your card into monitor mode." Option 3 is managed mode. It's actually option 2 for monitoring mode so you would type "2". 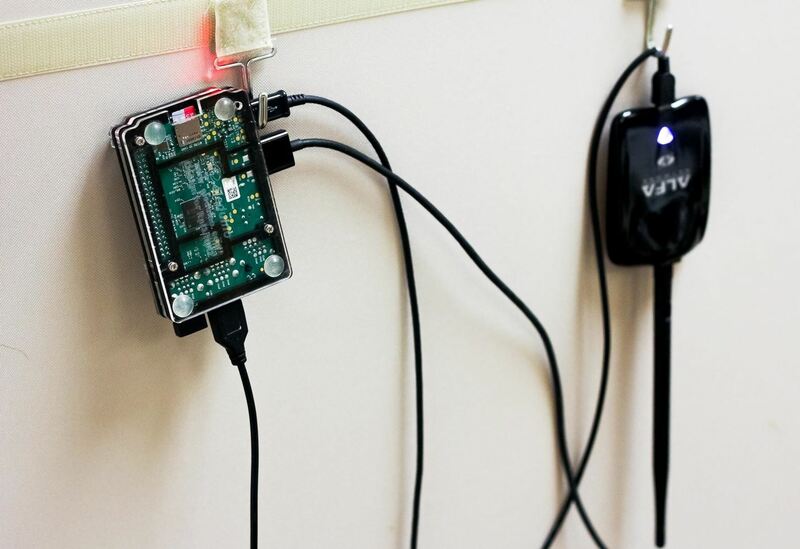 how would a raspberry pi and an alfa leave informations that can trace us back? no internet used, and the mac adress of a rpi have no signature that will identify a person. without being a part of the local environment, everything is done remotely and if done for one hour, after that a person stop to attack and some info will be stored in the log of the router probably but what more? people could be traced just when they are making the attack but not after ?right or not? because the ip of the card or everything else can be modified few seconds later? Is it Null Byte Admin's logo? Daaamn ! This is a good tutorial! "A graphical X window system has not been detected. If you already have one, chec k it's working properly. It's essential for airgeddon. The script can't continue"
can anyone lend a hand? I've been digging through and can't find the proper command to setup the graphical x window. why when i type the clone line, it just hangs up and does nothing? im connected to internet. Hi, wonderful tutorial. I have everything working well, but I'm wondering if possible how I would make a 1-click script/shortcut I can add to my Kali homescreen that will set an airgeddon DOS attack on a specific network planned in advance. Example- SSID "nuisancejerk" with MAC 12:34:56:78:90 is my common target for option 5, deauth/dissoci amok mk3 attack. But it takes a minute or so for me to open airgeddon, pass the welcome screen, select wireless card, monitor mode, survey my target, press Y for pursuit mode, and press enter a couple of times. Is it possible to create a script/shortcut that I could place on my home screen that automatically enters the above options for me? I'm new to Linux altogether, so any help would be much appreciated!